ANN ARBOR, Mich. — What happens when doctors misbehave? The answer depends a lot on which state they practice in, a new study shows. with the states with the lowest rates of discipline in the darkest colors. Delaware, Kentucky and Ohio came in with the highest adjusted rates for all disciplinary actions. But it’s the states with the lowest rates – such as Massachusetts, New York, Connecticut and Pennsylvania – that should probably look the hardest at their current standards, say the researchers. For the U.S. as a whole, they show that there are 3.75 disciplinary actions each year for every 1,000 physicians practicing – including 1.15 serious disciplinary actions. 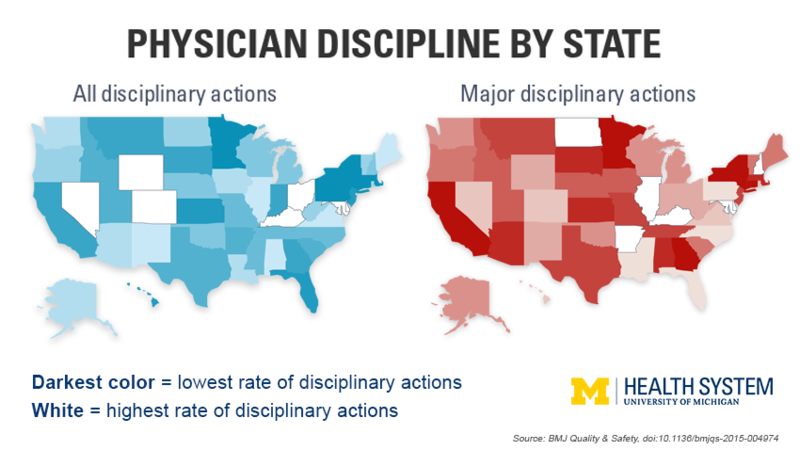 But the yearly range among states was huge, from 7.93 disciplinary actions of any type per 1,000 physicians in Delaware down to 2.13 per 1,000 in Massachusetts, and from 2.71 major actions per 1,000 physicians in Delaware down to 0.64 in New York. “In one state the punishment for a particular violation could be a fine, while in another state you could lose your license for doing the same thing,” says Byhoff. “It has implications for the ability of physicians to move from state to state,” if their punishment in one state is not enough to keep a hospital or practice in another state from hiring them.